The process usually begins with schools contacting us directly. They usually have an idea of where they would like to take their group and a rough idea of the itinerary they would like to follow. Being flexible and open to new proposals, GET will tailor the programme to meet the group’s needs. This process will take several or more emails to fine tune the programme to meet the requirements and budget of the school. Once the itinerary is confirmed the school should promote and sell the trip to the students and parents. We have various resources for schools to help them with this process: power-point presentations, photos, video and information pack. Once the school has confirmed numbers, GET will send an invoice and booking confirmation form to complete and return along with a deposit (deposit varies depending on dates of trip from first booking – see terms and conditions, available on request). Caution: GET will only confirm a trip once a signed booking form and the deposit have been received. GET cannot be held responsible for change to the itinerary or price due to non-payment of a deposit. What if our numbers change after the initial quotation? 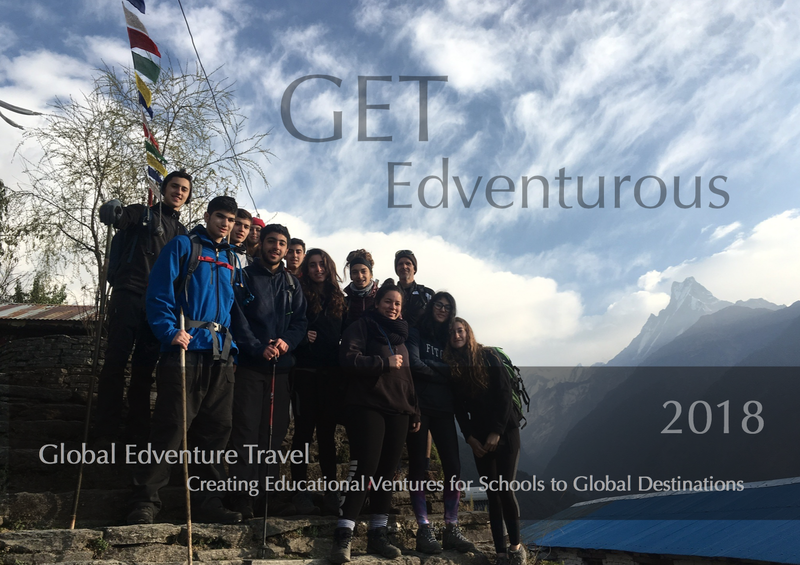 Once the itinerary has been confirmed for the group and you begin the selling process aimed at the students and parents, it is almost inevitable that numbers might change. If, after the deadline, your numbers have increased or decreased, contact us to obtain an updated cost based on actual numbers. What if someone drops out of the trip after payment? Follow the GET payment and cancellation guidelines in our terms and conditions, available on request. Does GET provide visa’s for travel to certain countries? The visa process and application is the responsibility of the school and/or parents. GET do not offer visa processing services or advice due to the large number of destinations we offer and their constantly changing rules and regulations. We strongly recommend you contact your nearest embassy for up-to-date information. Do GET organise our flights? No, GET has found that schools often have good relationships with local airlines and can obtain a better deal. This also keeps the cost of our packages down. Does GET belong to well-known organisations such as ABTA or the STF? No, GET operates world-wide with non-UK residents. To benefit from the likes of ABTA, or the STF, customers on our trips need to reside in the UK and travel from the UK. This often creates confusion when residents outside of the UK sign up for tours. Please be aware, should a company offering tours with this added security, that this added security is not applicable if you reside outside the United Kingdom and is only applicable to certain organisations. To contact us for more information or an enquiry click here.